In the early 1900s a fire here is said to have claimed the life of a housekeeper, who was caught in the attic and could not escape the building. Her ghost lives in the attic still, most of which was saved and restored. Folks say her presence can be felt up there, and she also throws glasses and silverware in the kitchen. Hi my name is KyLee im 10 years old and I live in Lake Quinalt. I live across the lake and many people I know have told me about this lady. Im in my second house in California right now but maybe when I get back to Lake Quinalt I will investigate. We stayed there in July. It became cold at night. The room heater went on at two o’clock in the morning, making a big noise that woke me up. The thermometer is not automatic. The nob on the wall had to be rotated physically to turn on the heat. My husband and daughter were sound asleep. My five year old daughter was not covered with any blanket. I covered her, rotated the heat that was making too much noise to off position and said to the air “thank you for telling me my daughter was cold” and went back to sleep. Neither of them knew what went on at night but I knew there was a spirit there looking after the property and people. A friend of mine’s daughter said she had taken a picture of the fireplace area. She said one of the pictures had an anomaly which looked like a shadowy figure. 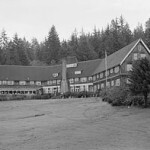 I have been to that lodge many times in my life and it “feels” like there is a presence at times, but not an evil one. I have never felt uncomfortable there on any of my visits.Quite the opposite, actually, as it feels welcoming. I currently work at the Lake Quinault Lodge as Line cook, and i’ve only started nearly a month ago. I’ve noticed that when we are closing up, while everyone is on their breaks I am still closing up the kitchen and I feel an earie presence. The other night, all of our sauté pans fell from the rack. Sliverwear had fallen after the dishwashers had washed and put them away. My wife and I stayed there last weekend. I woke up in the middle of the night and the bathroom light was on. That’s odd, because neither of us use a light at night. We don’t want to wake up more than we already are. I thought my wife was in there though because I surely wasn’t. In the am, I asked if she had gotten up and turned on the light. She thought I had done it. Neither one of us turned it off, but it was off when we woke up. Later that am, we heard the story about the place potentially being haunted.